By W. Gardner Selby on Friday, June 13th, 2014 at 9:55 a.m.
MSNBC's Chuck Todd said, "Cantor's campaign spent more at steak houses then Brat spent on his entire campaign." Politicos couldn’t resist passing along a factoid that seemed to capture the improbability of House Majority Leader Eric Cantor’s, R-Va., stunning defeat in his primary race against Dave Brat. 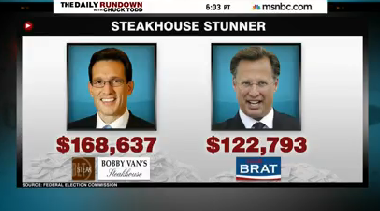 "Cantor's campaign spent more at steak houses than Brat spent on his entire campaign," said Chuck Todd, host of MSNBC’s The Daily Rundown. Talk about a claim made for headlines and Twitter. "Eric Cantor: Burned at the steakhouse," said Rolling Stone magazine. "High steaks politics" and "Where’s the beef" popped up in the twittersphere. There’s no disputing the accuracy of the comparison, which first showed up in the New York Times. According to campaign finance data collected by the Center for Responsive Politics, Cantor spent $168,000 on fundraising events at three Virginia restaurants -- Bobby Van’s Grill, Bobby Van's Steakhouse, and Blt Steak. Brat spent a little less than $123,000 across the board for his campaign, according to the most recent campaign finance reports, which cover spending up until May 21, 2014. Read PunditFact’s full analysis here.